Total global foreign exchange reserves, in all currencies, rose to $11.4 trillion in the fourth quarter 2018, according to the IMF's just released COFER data. These foreign exchange reserves do not include the Federal Reserve's holdings of dollar-denominated assets, such as Treasury securities and mortgage-backed securities. But the amount of USD-denominated exchange reserves ticked down to $6.62 trillion, and the dollar's share of global foreign exchanges reserves dropped to 61.7%, the lowest since 2013. Total global foreign exchange reserves, in all currencies, rose to $11.4 trillion in the fourth quarter 2018, according to the IMF's just released COFER data. These foreign exchange reserves do not include the Federal Reserve's holdings of dollar-denominated assets, such as Treasury securities and mortgage-backed securities. But the amount of USD-denominated exchange reserves ticked down to $6.62 trillion, and the dollar's share of global foreign exchanges reserves dropped to 61.7%, the lowest since 2013. In Q4, the euro's share of foreign exchange reserves rose to 20.7%, the highest since Q4 2014. The creation of the euro - the idea of eventually consolidating all European currencies in one big currency - was an effort to knock the dollar off its hegemonic pedestal. The goal was for the euro to eventually reach "parity" with the dollar. Then the euro debt crisis happened. The degree of dominance of the US dollar as global reserve currency is determined by the amounts of US-dollar-denominated financial assets - US Treasury securities, corporate bonds, etc. - that central banks other than the Fed are holding in their foreign exchange reserves. The dollar's role as a global reserve currency diminishes when central banks shed their dollar holdings and take on assets denominated in other currencies. This chart shows the battle among the lesser reserve currencies (without the dollar and the euro). Note the surge of the yen's share from 3.6% in 2014 to 5.2% at the end of 2018. 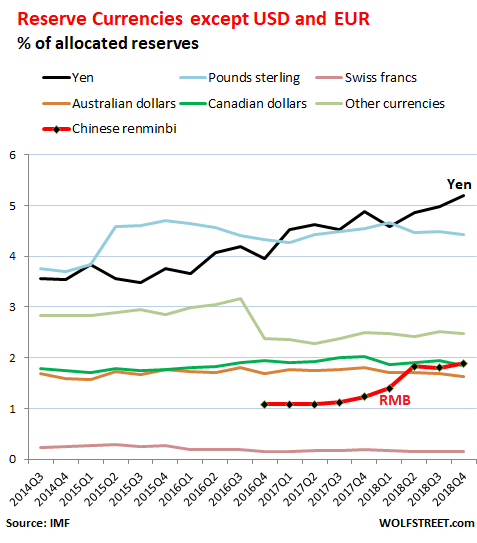 The renminbi is the red line that starts in 2016. 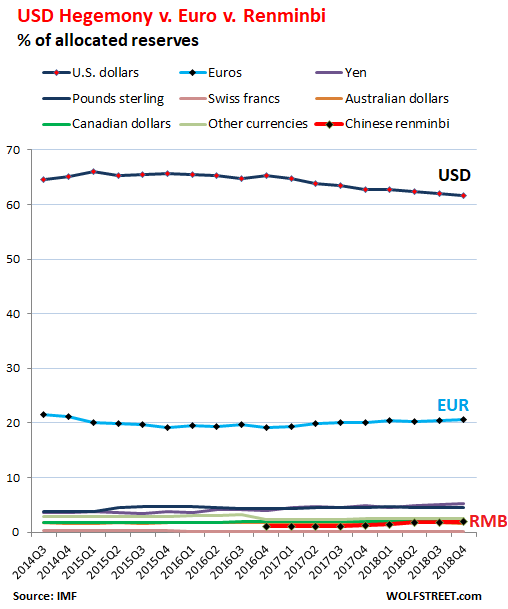 The share of "other currencies" dropped that year as the renminbi became an entry. The IMF doesn't disclose details, but we can assume that the renminbi had been listed under "other currencies" until 2016, when it was separated out. 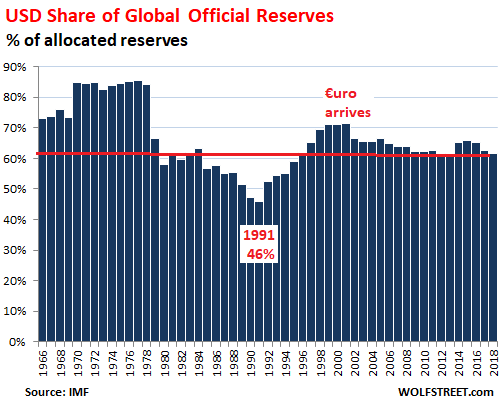 As the IMF points out, this data is based on the currencies' share of "allocated" reserves. Not all central banks disclose to the IMF how their total foreign exchange reserves are "allocated" among specific currencies. But disclosure has increased and the data is becoming more complete. In Q4 2014, "allocated" reserves accounted for only 59% of total reserves; now they account for 94%. And a special word about the theory that the US, as the country with "the" global reserve currency, "must have" a large trade deficit with the rest of the world. This "must have" is clearly not the case because the Eurozone - with the second largest reserve currency - has a large trade surplus with the rest of the world, showing that a major reserve currency can be backed by a big trade surplus. Japan also has a large trade surplus.